Wison Offshore & Marine has announced that the company has completed the final delivery for the world’s first barge-based floating natural gas liquefaction and storage facility (Caribbean FLNG). Prior to the delivery, the contracts for project financing provided by Bank of China, Deutsche Bank and supported by China Export & Credit Insurance Corporation have been officially signed, which laid a good foundation for the successful delivery of the project. Wison undertook the Caribbean FLNG project under an engineering, procurement, construction, installation and commissioning (EPCIC) contract with Exmar. 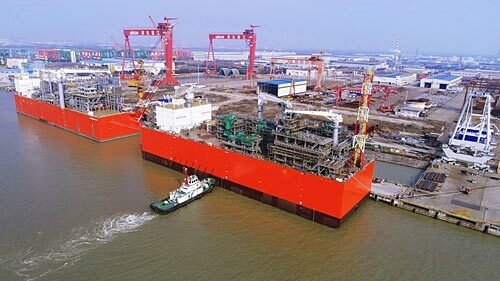 With a liquefaction capacity of 500,000 t/y, the FLNG successfully completed its performance test at the Wison yard in Nantong, China in Sept. 2016. This marks for the first time in history that LNG has been produced onboard a floating facility as well as the first time that a floating liquefaction unit has completed gas-trial and performance test before sail-out. Tags: Exmar, Wison Offshore & Marine Ltd.